Soooo if you are a regular reader of my blog you may have noticed the severe lack of posts recently. 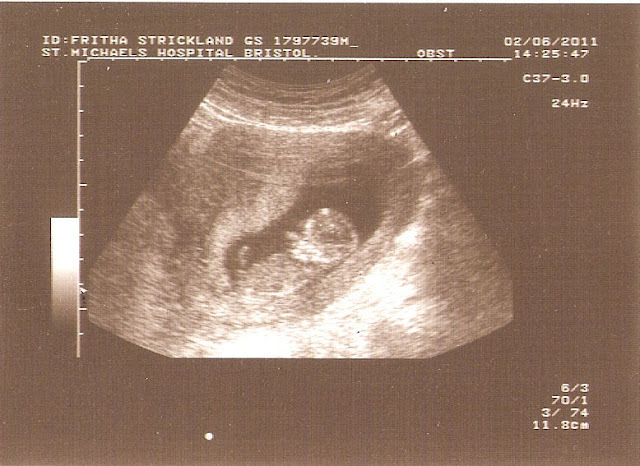 The reason for this is that I have been sick sick sick for the past two months...and the reason for this is..I am pregnant! Three months and one day to be exact. Eventually she got it to lie down still to take a pic and although Tom said there were better shots I am quite happy with the one we got given in the end. Quite baby shaped hur! I am still fairly under the weather but I am hoping it wont last for much longer (my mum always got morning sickness to about 16 weeks) fingers crossed it will be gone by then! Wow. You can really see a little bean in there. Hope you get over the morning sickness soon. congratulations lady!!! very exciting news :) Hope you start to feel better soon! Congratulations to you and Tom! What lovely news. I had a feeling that you might be pregnant from a couple of things you'd written, so good to know that my psychic-ness was on track! Hope you are feeling better soon. Thanks so much all of you :) really appreciate it! @michelle, yes I'm so pleased with the pic! This is fantastic news.....congratulations to the both of you. @Georgia I didnt know you were pregnant too! Congrats to you lady!Lets talk babys! Wow, huge congratulations! whoop whoop!